Shhhh....don’t tell anyone but it can be easy to be a vegan. Why? You don’t have to give up chocolate! If you buy a good quality chocolate, it will have a higher chocolate content, pure ingredients and no additives. The ingredients will be simple: cocoa, cocoa butter, lecithin, sugar and sometimes vanilla. Lesser quality chocolates are frequently not vegan. They have a long ingredients list, which, along with cheap fillers such as food starch and artificial flavorings, will often contain milk, milk solids or milk fat. But, you don’t want to waste your money on these anyway. Of course, there is the problem of BACON (sshhhh). Oh I can't wait to read your posts!! From the picture the "Do it Yourself Skinny Candy" looks like fun!!! Thanks for the great posts!! I usually eat vegan 90% of the time. I just bought Earth Balance(I believe that is the name, I'm at work so can't check) butter with cinnamon last night and put it on toast. OMG! My new love. These are great ideas! I eat mostly vegan (about 1 meal a week isn't vegan)...& it has helped me feel healthier & lose weight (127 pounds lost & counting)...it gets easier the longer you do it! Thank you! I have made the roasted chickpeas and they are delicious! You can change-up the seasoning to make them any way that you want them to be! I'm both gluten free and vegan (ish). It's been hard for me stick to it because I keep craving chicken & eggs. Thanks for every vegan recipe that you post! Lecithin (in chocolate) IS an additive, and one that should be avoided at that. There are plenty of good brands that make their chocolate without lecithin: the Whole Foods brand and Alter Eco are just two off the top of my head. I'm not a vegan fan .. what's wrong with eating an egg or honey. Vegetarianism, I get. Vegan, not so much. 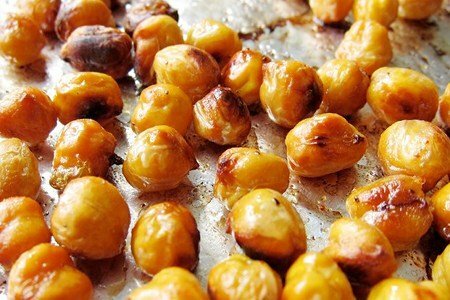 I do love the roasted chickpeas: they're always a hit when I make them. For a simple snack, though, I always keep roasted almonds and raisins at my desk. Sugar is not always vegan; it depends on the source. Cane sugar is processed through activated charcoal, which often comes from animal bones. This makes cane sugar non-vegan. So unless the chocolate bar specifies BEET sugar or has a "certified vegan" label on it... it's not vegan.